For each region, compare it's sales per year against total sales across all regions. As always, further explanations follows! It doesn't have to be this neat, but these will be the fields you'll need. 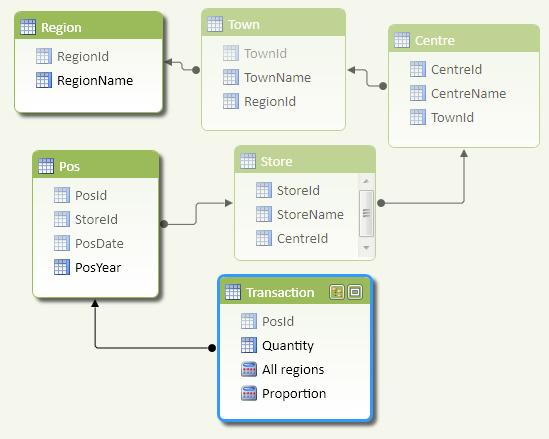 You'll need the regions table, the transactions table, and all the tables between them. All regions The total quantity of transactions, but for all regions (see hint below). Proportion The total quantity of sales for this cell (ie for this filter context), divided by the total quantiy of transactions for all regions. The syntax you'll need is =CALCULATE(SUM(something),ALL(some column). Save this workbook as Regional proportions, then close it down.